EXCITEMENT was at a high in IT Carlow recently as the Local Enterprise Office announced the winning teenage entrepreneurs from Carlow town and Bagenalstown who will represent the county at the national finals of Student Enterprise Programme. Three teenage entrepreneurs from two local schools will fly the flag for Carlow at the finals in Croke Park on Friday 3 May. At the Carlow final on Wednesday 27 March, an estimated 450 teenagers from ten schools throughout the county took part in the annual programme. 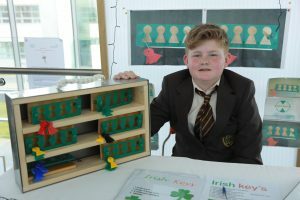 In the junior category, Sam Ó Broin from Gaelcholáiste Cheatharlach came out on top with his key-holding product ‘Irish keys’. The entrepreneurial duo of Niamh Bambrick and Sarah Baldwin from Presentation de la Salle, Bagenalstown also qualified with their entry, ‘Supporting her’. The girls’ project saw them partner with the 20×20 brand, which aims to increase media coverage of women’s sports by 20% before 2020. The inspirational fashion product sees the 20×20 brand incorporated into sportswear for men and women. Congratulating the students, Pauline Hoctor, senior enterprise development officer of the Local Enterprise Office in Carlow County Council, said: “We have a very successful student enterprise programme here in Carlow, with over 450 students from ten local schools taking part this year. Our national finalists are excellent ambassadors for the programme and we wish them the very best of luck in Croke Park on Friday 3 May. Kathleen Holohan, chief executive of Carlow County Council, said the students had worked hard with the support of their teachers, schools and wider community to create entrepreneurial journeys and looked forward to them representing “Co Carlow as fine examples of individuals who have ambition, innovation and success built into their DNA”. More information on the Student Enterprise Programme is available from www.studententerprise.ie.